James Perry is a New Orleanian and long time fair housing advocate. He ran for mayor of New Orleans in 2010. Has Hurricane Isaac taught Bobby Jindal that in the face of natural disaster, small government is no help? 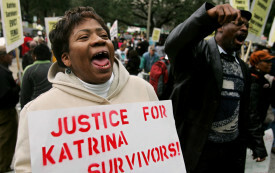 The Democratic Party found its voice in the aftermath of Hurricane Katrina. It owes the people of New Orleans a real recovery.